How to Stop Puppy Leash Biting? That is a question I get asked with almost every puppy client I work with. There is no one direct way to handle this, as every puppy is different. We must not forget, puppy biting is VERY common and VERY natural. Puppies are teething (as their new adult teeth come in) and puppies navigate life with their mouth (like babies do with their hands). I advocate that all new puppy owners take their puppy out for daily walks. This is terrific for socialization (which should happen before 16 weeks of age), exercise, and bonding between dog and owner. So you probably want to know, how to stop puppy leash biting? There are a few ways to address this. You can try whichever you want and see what works best for your dog. – Make sure to use proper technique. The leash should be loose, but not with excessive leash hanging in front of your puppy’s face to bite and hold onto. Also try to have the leash run up the back of their head and between the ears. – Use a food lure to help redirect your puppy’s attention off the leash and on you. This is an important exercise which teaches your dog to be engaged with you and also how to “Heel” at your side. – Spray the leash with a taste deterrent. Bitter apple or white vinegar are possible taste deterrents that you can spray on the bottom portion of your leash. This should be reapplied before every walk. – A thin chain extension. I have had many clients achieve great success by attaching a thin chain collar as an extension of their leash. Puppies are not interested in chewing on chain. 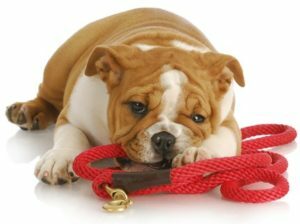 Once they lose interest and are no longer in the habit of biting your regular leash, you can remove the chain extension. – Water spray. Many puppies find a misty spray of water to the face to be slightly annoying. This makes for the perfect low level correction for their biting. Make sure to say, “No” and consistently follow-up your puppies leash biting with a misty spray of fresh clean water to their face. Every puppy is different, so the key is to find a solution that works for your puppy’s leash biting. As always, consistency is essential for dog training. Regardless of which option you choose, make sure to consistently implement it until your puppy no longer bites the leash. This will teach your dog the very important life skill of how to be on-leash and allow you to fully enjoy a walk with your dog.